Enjoy celebrity look with our new collection of stylish party jewelry set. 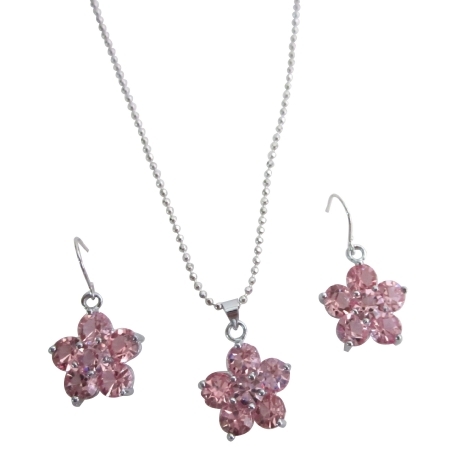 Cute delicate jewelry Rose crystal flower pendant earrings set looking for girl friend or Valentine or Xmas gifts Rose crystal Flower pendant & earrings set holiday gifts at budget price chic cool absolutely inexpensive Rose crystal Flower shaped pendant with matching earrings dangling exclusively meaningful affordable gift for Holiday Gift come with gift box. The main beauty is the lot of craft work embossed & dress up with many accessories this fashion jewelry is a must have for fashion savvy this beautiful set perfect for Holiday Gifts Christmas Gifts Birthday Gifts or for wedding Bridesmaid gifts Prom party & for other special occasions.